Weblog of Dashmesh Pictures [V.1.1]: MacSikh loves T.O. 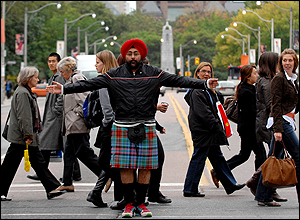 After taking to the streets of Toronto, proud Scotsman Hardeep Singh Kholi pronounces the city "a groovy place." This, after discovering that Canadians are far better informed about Sikhs than their British cousins, whom he interviewed Rick Mercer-style for a hilarious film screening this weekend at Spinning Wheel, a festival of films by or about Sikhs. Asked to guess where the jovial, imposing 6-footer — sporting a bright red turban and full beard with jeans and sweater — comes from, a dozen Torontonians deliver answers so heartwarming they made him want to immigrate here. Some, like construction worker Daniel Rioux, start out amusingly with, "Well, it ain't Poland." Adds fellow builder Steve Dafonte: "Does it make a difference? We're all brothers from different mothers." Most of the folks he waylays downtown assume Kholi is Canadian because, well, why wouldn't he be? Only after hearing his accented English do they deduce that he was raised in Britain, and from his appearance, that somewhere along the line, his ancestors came over from India. "Because you're brown and you're wearing a turban," says Nadia Amir, a student. The only thing people get wrong is the accent. The missing clue is the kilt hanging back in Kholi's hotel room, which he dons later for a photograph. "The reactions are so cool. It's a great tribute to your country. If people everywhere naturally assumed you're one of us and not one of them, how lovely would the world be?" says Kholi, 37, in his thick Glasgow brogue — adding, deadpan: "I always run the risk of sounding like a Whitney Houston lyric." In Kholi's short film Hardeep Does Race, he puts the same question about his origins to strangers in a town just outside London, England. Unlike Toronto, everyone there assumes he's a foreigner. Only one person gets it right. "Some people thought I was from Cambodia or Afghanistan," Kholi says with a chuckle, adding that the response surprised him. "I was sort of expecting people to say, `You come from India.'" The difference in perception is perhaps linked to immigration patterns and a lingering colonialist mentality in the UK, he says. "Even though we (immigrants) have been there for such a long time, in what capacity have we been there? We've been there doing those faceless s--- jobs the locals didn't want to do. They weren't giving us the good jobs they wanted.... So consequently we were in the places they didn't see us, in the places we became one homogenized group. As we're more comfortable and confident as British people, things are changing." Born in Britain to Sikh parents who emigrated from India in 1965, Kholi was raised in Glasgow, a place he says is not unlike the Punjab, where his parents are from. "They love partying, heavy drinking and eating red meat in Punjab, and similarly in Glasgow. It's a working-class city and that's where Sikhs come from, working-class roots," says Kholi, who graduated from law school and worked for the BBC before following his passion as a filmmaker and comic. "My mum is still really pissed off I'm not a lawyer, but what can you do?" Growing up as a turban-wearing Sikh in 1980s rough-and-tumble Glasgow was difficult, he admits, quickly turning that to a joke: "I wasn't a very good-looking child either, which didn't help. I was so ugly when I was born the nurse slapped my mother. " But for every one of those nutters that try to knock your turban off in the street, there are 10 people who will defend your right to be who you are to the death. People in Glasgow are so passionate about multiculturalism and everyone being together that they will actually stand in front of you in a fight, and that's incredibly touching and uplifting." Kholi has become a celebrity in the UK after writing, directing and acting in a six-part comedy series, Meet the Magoons, about a Punjabi family running a curry house in Glasgow. It aired on Channel 4 last year. He's writing another sitcom for the BBC, A Fine Living, about traffic wardens. Sikh on the Street, another film screening at Spinning Wheel, shows that Americans are just as ignorant about Sikhs as the Brits, but sometimes with tragic consequences. Many Sikhs were attacked in the aftermath of 9/11 by people who thought they were Muslim terrorists, including Balbir Singh Sodhi, shot dead in front of his Arizona gas station. None of those interviewed for Sikh on the Street knew anything about the heroic Bhagat Singh Thind, who, after serving in the U.S. Army in WWI, was denied citizenship because of his ethnicity by a Supreme Court ruling in 1923. Thind went on to earn a PhD in metaphysics and eventually won citizenship. Like Kholi, filmmaker Sartaj Singh Dhami asked people on the streets of Washington, D.C., to guess his heritage. Most said Middle Eastern, Persian or Muslim. Some believed Sikhism is a faith of "mystics and wanderers." "Americans don't know jack about Sikhs." It's up to Sikhs to educate people about their way of life, he adds. Rather than getting it wrong, people should simply ask, Kholi agrees. "The crime is not to ask. It's more offensive, surely, when people feel unable to approach us and ask us and question us. I do think political correctness has been a sledgehammer to civil liberties and understanding." Immigrants and the children of immigrants tend to balance on a "fulcrum of past, present and future," says Kholi, adding that he believes being secure with your roots is the key to moving forward. In seeking understanding from others, he adds, you must also commit to the place where you now call home. "If we don't engage in contemporary issues and the society we're in, then we have nothing to fall back on when we try to protest our own civil liberties being encroached," he says, pointing to the plight of Muslims in the UK in the era of terrorism. "The way you change hearts and minds isn't always through the law or force — it's actually by being more charming and inveigling yourself in people's lives." Hardeep Singh is a comedian and filmaker from the U.K. whose film "Hardeep Does Race" will be screened at the Spinning Wheel Festival this weekend.